"Thank you for everything Bob, really great service, everyone had such a good time. We'll definitely use Boomerang again." The Sunshine Coast attracts many golfers, and with good reason. Beautiful weather, pristine greens and world-class club houses are just the start. Whether you're an amateur mastering the art of strokes or a professional golfer, Boomerang Bus Hire is the perfect choice to transport your group. Enjoy a round on the Sunshine Coast, and you'll be amongst some of the finest golf courses you can swing in. Whatever your transport requirements, Boomerang Bus Hire is here to assist from your private airport pick-up, right through to the 18th hole. Contact Boomerang Bus Hire for a quote that won't break the holiday budget. Our charter bus team will work hard to ensure we meet your exact requirements for your Sunshine Coast golf trip. And we'll take as much care of your woods and irons, as we do of your group. Are you in the business of planning golf tours? 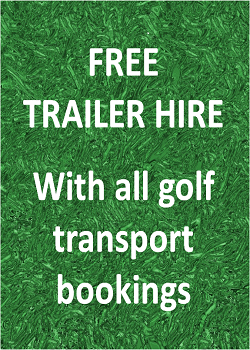 Boomerang Bus Hire is happy to work with other businesses that plan golfing holidays. We offer competitive prices and an excellent service that will impress your customers and are an asset to your business. Have you organised all the aspects of the trip, but just need a reliable company for your transport? Then email or call us on 1300 BUS MAN for a no-obligation quote. Savour a few drinks at the club house at the end of the day, knowing your return journey is in-hand. Book your transport with us, and concentrate on YOUR driver in the capable hands of OUR drivers.